Something tells me I don’t have enough yarn left to finish this sock. I definitely need to learn how to knit toe-up. I don’t know why I haven’t learned yet. I own three books that are all about knitting toe-up socks. My problem is technique inertia. I want to learn a new skill, but that takes effort. And why bother when the old skill works just fine and requires so little mental energy. No more excuses. I vow, I will unravel this sock and start over from the toe. I get wanting to learn toe up. Since I did, I’ve never gone back, but WHY oh WHY would you want to unravel that much of a sock to do it? I don’t understand?!?!?! Well, I’m out of yarn. They were these little balls and I sort of assumed that each one was one sock’s worth based on weight. I’ve got one more little ball and technically I could continue where this one leaves off, but then I would have 1.5 socks, which isn’t much use. Judy’s Magic Cast On! Judy’s Magic Cast On! Judy’s Magic Cast On! You’ll have to break the inertia to get started, but I promise that it is worth it. I concur–Judy’s Magic Cast On. I’ve tried lots of toe-up cast ons, and JMCO is hands down the best. I knit socks toe up when I’m not certain I’ll have enough yarn, but otherwise I knit them cuff down because I get a better fit with a heel-flap-and-gusset heel. You can make such a heel working toe up, but it’s incredibly fiddly. Toe up is definitely a technique you should add to your sock-knitting arsenal. I never tried a toe up sock either, we can try to motivate ourselves by a little KAL if you like! I’ve definitely gotten hooked on toe-up. Even when I weigh my yarn into to perfect, equal little balls I still get paranoid. Even knitting toe up I’m still have convinced every pair of socks I make is going to be ankle socks – and they never are. LOL I think this is why I mostly stick to sweaters. I needed motivation to make the jump to toe-up and this is it. I’m still working on locating willing recipients for my socks, however. People seem unnaturally leery about the idea. Give them to another knitter! Or keep them yourself. Knitters tend to be a lot more appreciative of wool socks than non-knitters. You know, that may be the most practical idea of all. I wonder if I have something suitable in my pile of scrap sock yarn. I’m sure I must. Oooohhh!! 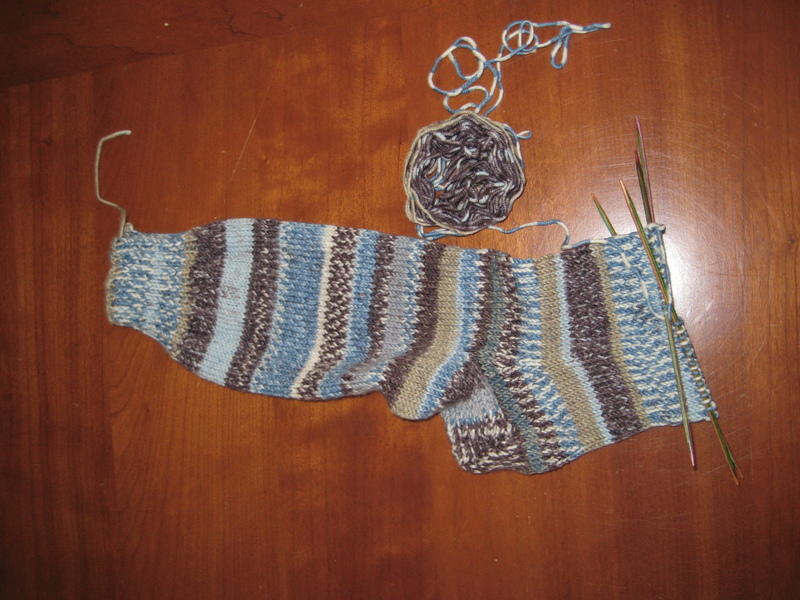 I am hoping I have enough for my sock too…I’m using a contrasting color for landmarks and to lengthen the sock without having to use the variegated handspun…On pins and needles!